Do you know the 4W1H law? It is said that the basics of sentences and conversations [WHEN] [WHERE] [WHO] [WHAT] [HOW] five keywords. It is said that clarifying this 4W1H is also important in problem solving and information transmission in work and daily life. 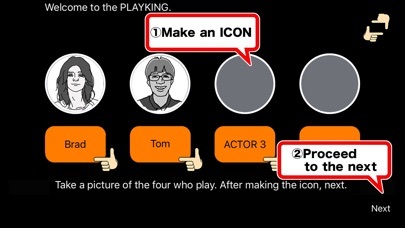 [PLAYKING King of Acting] is an application that allows you to acquire the ability to communicate with your work and friends just by enjoying it as a game. ◎As entertainment. [PLAYKING King of Acting] can create a 3-minute improvised drama simply by continuing the conversation using these five keywords. ◎As an education. By repeatedly using [PLAYING King of Acting], you will be able to acquire the expressive power of actors and the correspondence power necessary for working people over time. 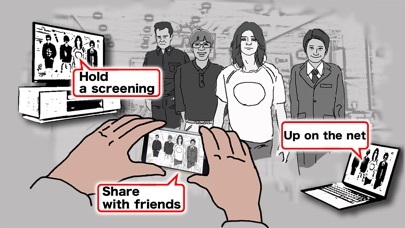 Enhance your community skills and create your own entertainment that you never had before. I want to be a protagonist. I want to make a drama. I want to be a YouTuber. But that is not easy. Feeling so, Aren't you giving up? 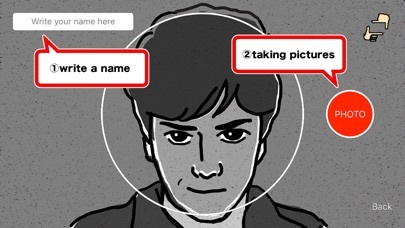 [PLAYKING King of Acting], you can create your own video work with automatic opening, ending, and even music in just 3 minutes. ーーーーーーーー Rule ーーーーーーーー Play with 5 players [4 players] and [Director] to shoot. (Even three players are possible.) Each player should take charge of the word of [WHEN] [WHERE] [WHO] [WHAT] one by one, and let other players use it. The other player derives the word from the conversation, and uses that word to make a story that clarifies [when], [where], [who] and [what]. Play time is 3 minutes. [HOW] is a [action] word that decides how to put together a story, which can be used 30 seconds before the end. [Theme] is a category of music that flows while playing. ーーーーーーーー How to play ーーーーーーーー The director opens [ACTOR], enters the names of the four participating players, and takes a face picture. When the player's icon is complete, tap [Next]. Players tap the button with their icon and check the word so that other players can not see it. Please check [HOW] with everyone. 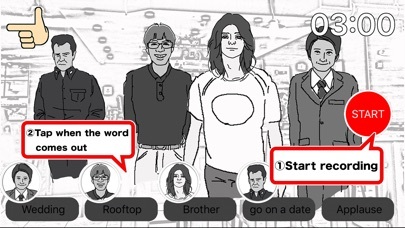 When all players have confirmed, the player waits in play position and the director taps [PLAY]. When you are ready to play, hold the camera, send a signal, and tap Start to start recording. 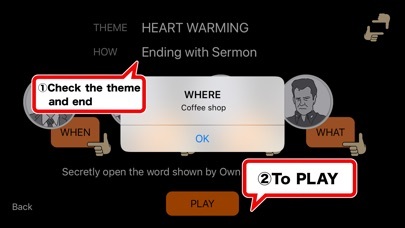 When the player's word comes out, the director taps their respective button to let them know the correct answer. During play, music that matches [THEME] flows 2 minutes ago and 30 seconds ago when it started. Please play according to the image of the song. The use of [HOW] becomes possible 30 seconds before. 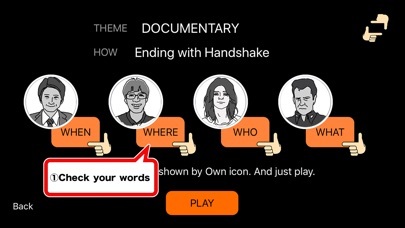 Play with the action described in [HOW], and tap the button when you can do the word action. When the gong sounds, play is over. In about a minute, videos are saved to the [Album] folder. ー ー ー ー ー ー ー Various usage ー ー ー ー ー ー ー 1 Post on a video site such as YouTube. 2 Hold screenings with events and friends. 3 For teaching materials for employee education and review of acting. 4 Others, as you think. Now, please use [PLAYKING King of Act] and make your dream come true while having fun.